Linda Fiore (co-director, violin) began violin lessons at age 5 with her mother Louise Wear, a Suzuki violin teacher. She earned a Bachelor of Music in violin performance at the Hartt College of Music in Hartford, CT and studied with violinist Raphael Bronstein in New York City. later, she studied with Dr. Suzuki at the Talent Education Institute in Matsumoto, Japan for 18 months. She performed her graduation recital and earned her Japanese teaching certificate. Upon returning to the United States, she became the first teacher to teach Suzuki Violin Method for brain-injured and well children at the Institute for the Achievement of Human Potential in Philadelphia. In 1983, she and her husband Domenick founded DaCore Talent Education in Glenmore, PA where, for 14 years, she taught violin and directed her own workshops. She has presented student performing groups in Bermuda, Puerto Rico, Europe, and throughout the United States. In 1997 she accepted a teaching position at the Hartt School of Music at the University of Hartford. She was a Suzuki Teacher trainer in the graduate degree program there and also taught college students as well as young students in the school’s Community Division. Having returned to PA, Linda and Domenick are currently continuing the development of DaCore Talent Education Academy and Fiore Performing strings in the Lehigh Valley area. They continue to co-direct the Ogontz Suzuki Institute, a four-session Summer Institute in the White Mountains of New Hampshire. Linda has done extensive orchestra, chamber orchestra, and chamber music performing over the course of her career with groups such as the Lehigh Valley Chamber Orchestra and the Northeastern PA Philharmonic and the Pennsylvania Sinfonia. She traines teachers and students nationally and internationally and is the mother of two sons, Michael and Christopher. Domenick Fiore (co-director, bass, orchestra) began studying the double bass with Wes Fisher in Reading, Pennsylvania, at the age of 14. He attended the Philadelphia Musical Academy where he studied with John Schaeffer, principal bass of the New York Philharmonic. After graduation, Domenick freelanced in the Philadelphia and New York City areas, performing in Broadway shows, The Brooklyn Orchestra, the National Ballet of Canada, and the Duke Ellington Pops Concerts. He earned a Bachelor of Music Education degree from West Chester University and began teaching in the Ephrata, Pennsylvania School District. Domenick has been director of orchestras and chamber music at the Mid-Southeast Suzuki Institute, Snowmass Suzuki Institute, Chicago Institute, Calgary Suzuki Institute, Central Pennsylvania Institute, and the Hartford Suzuki Institute, as well as clinician at the Bermuda, Puerto Rico, Hickory (North Carolina) and Augusta (Georgia) Suzuki workshops. He was the director of the five Suzuki orchestras of the Community Division at the Hartt School of Music. In addition, Domenick had a thriving young bass program through the Community Division at Hartt. He and Linda currently live in the Lehigh Valley where they have established a Suzuki studio and freelance throughout the region. Annie Barley Givler (cello) began playing the cello at the age of two, studying with Carey Beth Hockett. Annie attended the Eastman School of Music and the University of South Florida, earning both bachelors and masters degrees in cello performance and music theory. Annie has lived and performed all over the world—from Tanzania to the South Bronx, but now makes her home in Philadelphia. In addition to her life as a Suzuki cello teacher and professional cellist, Annie is a passionate urban music educator. She taught for the KIPP charter school network for the past ten years, developing culturally relevant strings and general music curriculums for K-12 urban youth. 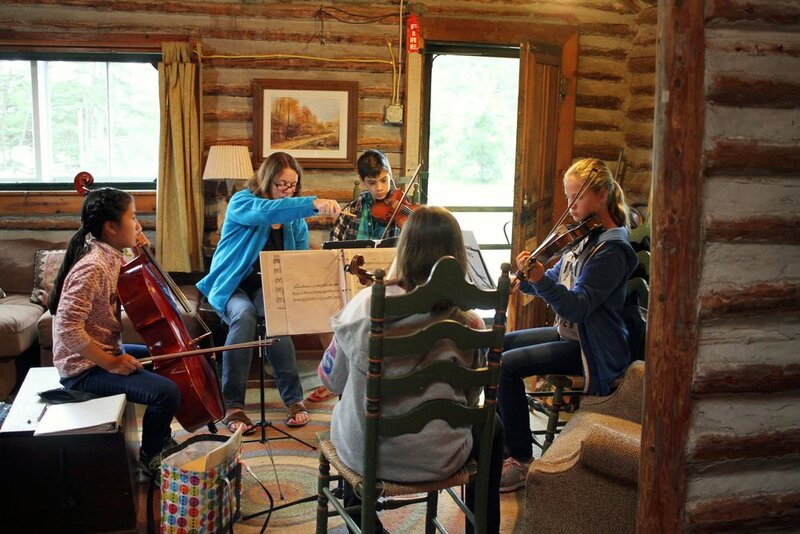 Annie maintains a private cello studio in the home she shares with her husband Harley and their three children. Kim Barrett (violin) began studying the violin at age 12 with Linda Fiore in Pennsylvania. After graduating from West Chester University with Bachelor Degrees in Music Performance and Music Education she went to Matsumoto, Japan to study personally with Dr. Shinichi Suzuki and other master teachers. During her 3½ years in Japan, Kim assisted in translating for Dr. Suzuki and his writings and performed to demonstrate his teaching and method. After graduating from the Talent Education Institute, she returned to the United States in 1991 with her husband, Tim. Kim also holds a Masters Degree in Violin Performance from the University of Tennessee. Currently, she and her husband, Tim Barrett, teach and direct the violin program for the Academy of Strings in Johnson City, Tennessee. Chris Fiore (cello) Christopher Fiore began studying the cello at the age of four with his parents, both of whom are established Suzuki teachers and performers in the Philadelphia area. He spent two years at the Hartt School of Music in Hartford, Connecticut, and later transferred to the Cleveland Institute of Music, where he finished his Bachelor’s Degree in Cello Performance with former Cleveland Orchestra Principal Stephen Geber. After graduating from CIM, he went on to the DePaul School of Music in Chicago, Illinois, to obtain a Masters Degree with former CSO Assistant Principal Stephen Balderston, as well as a Performance Certificate with current CSO member Brant Taylor. Throughout his high school and college years, Christopher was also fortunate enough to study with world-renowned Suzuki Teacher Trainers Pam Devenport, Nancy Hair, and Tanya Carey. While completing his Masters Degree, he studied with Tanya Carey to complete his training in all ten Suzuki Books, as well as finishing a Teaching Practicum course, where his teaching was evaluated over a semester of private instruction. During this time he also took pedagogy courses with both David Evenchick, and Susan Gagnon. Just recently he completed Revisiting Book 1 with Sally Gross. Christopher has been teaching for over 14 years, and has helped to build numerous cello programs, including working with Michele George and Diane Sloane at East Cleveland Rainbow Suzuki Strings, in East Cleveland, Ohio, and the DePaul Community Music Division in Chicago, Illinois. He has also been the Cello Director at both the Oak Park String Academy in Oak Park, Illinois, and the Merit School of Music in Chicago, Illinois. As well as teaching privately, he spends his summers traveling to various Suzuki Institutes within the United States, and in the past has been invited to teach in locations such as Puerto Rico, Bermuda, and Costa Rica. He is also an active performer, playing with various orchestras in the D.C., Northern Virginia, Maryland, and Greater Philadelphia areas. Based in Los Angeles, Michael McLean is an internationally noted composer, violinist, and pedagogue. On the faculty at The Colburn School of Performing Arts as a violinist and conductor, he also maintains a lively career as a composer of orchestral, chamber, and film music. He studied violin and composition at Northwestern University and film scoring at the University of Southern California. He has taught violin at the Music Institute of Chicago and at Texas Christian University. Mr. McLean is a popular guest clinician at workshops and Institutes throughout the country, and has been invited to teach and perform in Argentina, Singapore, and Africa. An active member of the Suzuki Association of the Americas, he has studied Suzuki pedagogy with Yuko Honda, Barbara Barber, and John Kendall. Mr. McLean has written over one hundred compositions and has recorded four CDs, Care to Tango?, New World, Pieces, and Kokoro. His Violin Concerto, Elements, was recorded by Brian Lewis and the London Symphony Orchestra and was released by Delos in 2006. His publishers include Alfred Publishing (Care to Tango?) and Latham Music. He is currently working on his second Violin Concerto and the film score for a PBS documentary on Louis Sullivan. Michael also loves to hike in the Sierras and run marathons. Sarah Smale (violin/viola) began her musical studies on violin, viola and piano in Oxfordshire, England. She attended the Birmingham Conservatoire where she received a BA with honors. She continued her studies at the Guildhall School of Music in London. In Hartford, CT, she studied with the Emerson String Quartet and acquired her Suzuki training with Linda Fiore and Teri Einfeldt. Sarah has won several awards, including the Birmingham Conservatoire string quartet scholarship and the Herbert Lumby Viola prize. She has worked with world-renowned artists such as Pierre Boulez, Yuri Bashmet, Nicholas Kramer, Steve Reich, Sir Simon Rattle, Valery Gergiev, and Roger Norrington. Her experience includes numerous concerts and seminars with talented quartets and orchestras including: Takacs Quartet, European Chamber Orchestra, Russian National Ballet, and the Emerson Quartet, to which she was the assistant. Sarah has also played with numerous choral societies as principal viola, recorded television work for the BBC, and recorded extensively for Radio Suisse. She performs with the European Festival Orchestra in Neuchatel, Switzerland, where she is principal viola. Chris Souza (violin) Chris Souza began studying the violin at the age of nine with Suzuki teachers in the Boston area. During high school he studied with Mark Thielien and Dorothea Baxter at the Harrison Center in Lakewood, FL. He joined the Imperial Symphony Orchestra and performed with renowned acts such as The Moody Blues and violinist Eugene Fodor. He also taken master classes with the members of the Colorado String Quartet and the London Symphony Orchestra in the Florida International Festival. After receiving his Bachelor of Arts degree from Lee University, he gave concerts on stages across Europe on three international chamber music tours. While working on a masters degree in Springfield, MO, Chris studied viola with Darrel Barnes, former principal violist with the St. Louis Symphony and member of the Lenox Quartet. He performed with the Springfield Symphony Orchestra, Springfield Opera Company and The Chamber Orchestra of the Ozarks as well as the New Haven Chamber Orchestra. 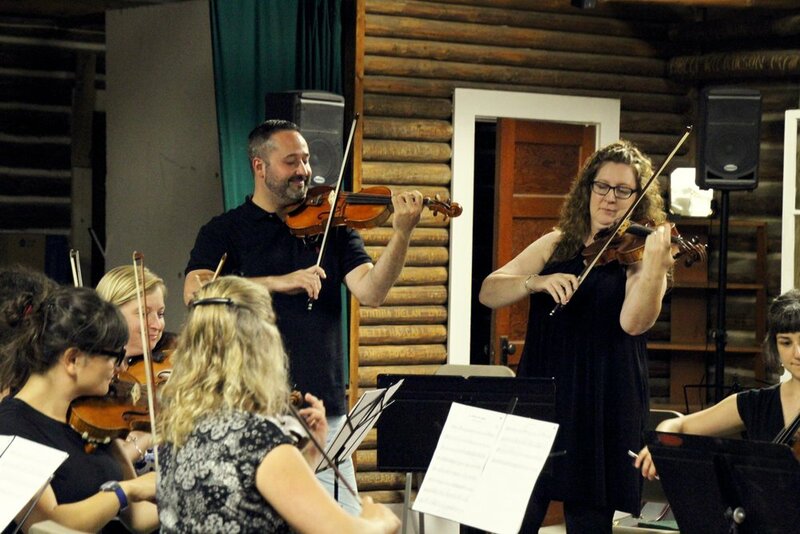 In addition to freelance work, Chris performs regularly with the Monocacy Chamber Orchestra. He toured Eastern Europe as principal viola with the Lehigh Philharmonic Orchestra, and the American West as principal viola with the Barbizon Chamber Orchestra. Christopher is a registered Suzuki violin teacher with a studio in Tannersville, PA. He has received Suzuki training from Michelle Higa George and Linda Wear Fiore. James Selway (theater) James Jillson Selway is a graduate of The Juilliard School and The Catholic University of America. Mr. Selway is President of Harnes Selway Arts, Falls Church, Virginia, where he maintains a Suzuki piano studio. He has also directed operetta and music theater productions for the Harnes Selway Arts summer program, Singers Onstage. He is organist and Youth and Children’s Choir director at St. Peter’s Episcopal Church, Arlington, Virginia. Mr. Selway is Associate Director and pianist of the World Children’s Choir. Mr. Selway has performed Ambassador Drosselmeyer in BalletNova’s production of The Nutcracker since 2005. He also performs with Candy Braden in the dance duo Braden and Jillson. Donna Ngai (violin) Donna Ngai has been teaching in The Hartt School Community Division Suzuki program since 1996. Along with teaching Suzuki violin private lessons and group classes, she also coaches chamber music ensembles and is the instructor for the Suzuki Parent Education course. Donna earned her Suzuki Early Childhood Education (SECE) training with Dorothy Jones (Level 1) and Lynn McCall (Level 2). She has been a contributor to the Suzuki Association of the Americas "Parents as Partners" video conference and has been on faculty at various institutes and workshops such as Ithaca College Suzuki Institute, Ogontz Suzuki Institute, New England Suzuki Institute, Atlanta Suzuki Institute, Studea Musica at Orford Centre for the Arts, la Academia de Suzuki in Puerto Rico. Ngai completed her long-term Suzuki training with Teri and David Einfeldt at the University of Hartford's The Hartt School, with additional Suzuki Pedagogy training with Linda Fiore, Michelle George, Christie Felsing, and Gilda Barston. In addition to receiving her degree from The Hartt School, she has attended Indiana University and Manhattan School of Music. Her principal violin studies have been with Mitchell Stern, Philip Setzer, and Lucie Robert. While Ngai enjoys her teaching tremendously, one of her greatest joys is being a Suzuki parent to her two boys, Tyler (12, cellist) and Aidan (9, guitarist). Alexis Zingale began her piano studies at the age of four and presented her first solo recital program at age nine. Ms. Zingale has performed throughout the U.S. and Canada as soloist and collaborator in a variety of venues, winning numerous awards in both roles. Ms. Zingale has recorded for Peer Music Classical and the Charles Ives Society, and her performances have been broadcast on Connecticut Public Radio. Ms. Zingale is an adjunct professor of piano and chamber music at the University of Bridgeport, a staff accompanist at Western Connecticut State University, a piano faculty member and staff accompanist at the Neighborhood Music School in New Haven, a piano faculty member at the Suzuki Music School of Westport, and the accompanist for the New Haven Oratorio Choir.